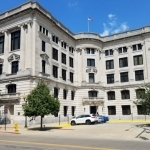 A Vermilion County Circuit Court jury deliberated about four hours Thursday before finding a Danville man guilty of first-degree murder. Twenty-five year old Latron Cross will be sentenced later in connection with the July 2017 shooting death of Danville resident Ollie Williams. Jurors also found that the issue of Cross personally discharging a firearm was not proven. But Vermilion County Public Defender Mike Mara disagreed. ‘’He didn’t shoot Ollie and he didn’t kill Ollie,’’ said Mara about his client Latron Cross. Mara said Cross was at his grandmother’s house when the shooting occurred. ‘’Where’s the gun? Where’s the DNA,’’ asked Mara as he addressed jurors. A sentencing hearing will be set later. Judge Nancy Fahey scheduled a hearing next month on post-trial motions.